The New… and Edit... buttons on the Feature Class Admin form both open this form for creating/editing feature classes. The spatial reference of the map will be selected by default, but can be changed if required. Select or browse to the required spatial reference. We recommend using the browse function, as the list is very long and take a while to load. 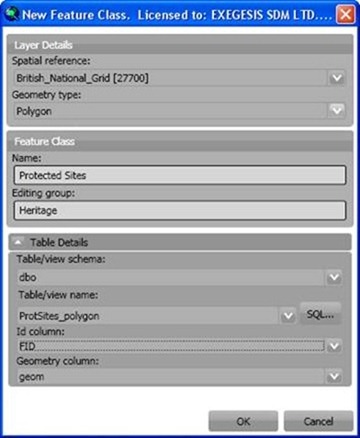 Select the geometry type for the new feature class. This cannot be altered for existing feature classes. Specify a name for the new feature class. This can be the same as the table/view name, or can be an alias. This name will be the default when the data is shown as a layer in ArcMap. The form will not let you use the name of a feature class that already exists in the database. If you need to replace an existing feature class, first remove the existing feature class using the Feature Class Admin tools. This pick-list shows schema in the database from which you can select an existing table or view. The default schema of the connecting user will be selected by default, but can be changed if required. This pick-list shows all tables and views in the selected schema. Select an existing table or view, or use the SQL… button to create a new view. GISquirrel needs to know which column contains a unique record identifier. This will be automatically detected from the select table/view if possible, but the selection can be changed if required. GISquirrel needs to know which column contains the feature shape/geometry information. This will be automatically detected from the select table/view if possible, but the selection can be changed if required. On clicking “OK” a new record will be added to the "arcsquirrelmetadata" table, and the form will close returning you to the Feature Class Admin form.